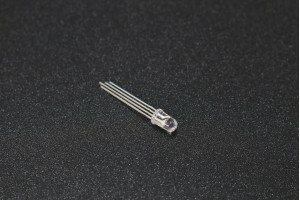 This light sensor module or light dependent resistor module (LDR Module) uses the GL5528 photo-resistor to detect the light intensity of the environment. The resistance of the sensor decreases when the light intensity of the environment increases. The LM393 op-amp is configured as a "voltage follower" to increase the accuracy of this device. · Operating voltage: 3.3 to 5Vdc. · Operating current: 10mA with 5V. · Adjustable trigger threshold. Adjust potentiometer clockwise to increase sensitivity. · Digital and analog output. · Analog output can be connected to microcontroller analog pin to get light intensity value. · You can make a light turn on when it is getting dark. · With a laser pointer you can make a cheap intruder alarm. · Tracking of solar panels to the sun direction for best solar power generation efficiency. This is a laser emitter diode. The working voltage is 3V to5V DC, with a wavelength of 650nm Red C..
Specifications• Resistance (Ohms): 4.7 Kil..
Heart rate pulse sensor is designed to give digital output of heat beat when a finger is placed on ..